Sixty-two years ago, the U.S. Supreme Court ruled “the doctrine of ‘separate but equal’ [had] no place. Separate educational facilities are inherently unequal.” Yet if two recently released studies are to be believed, for too many children our public education system is becoming more segregated along both racial and economic lines. The share of intensely segregated nonwhite schools (which we defined as those schools with only 0-10% white students) more than tripled, rising from 5.7% to 18.6% of all public schools. Even as the resegregation was taking hold, there was a sharp decline in the percent of segregated white U.S. schools that have a tenth or fewer nonwhite students, dropping from 38.9% to 18.4%. The result of these diverging trends is that whites can perceive an increase in interracial contact even as African American and Latino students are increasingly isolated, often severely so. 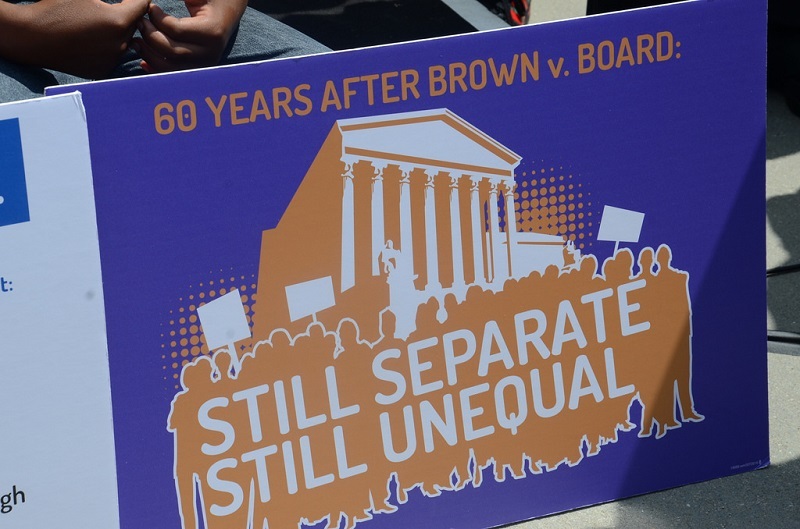 The challenge of segregation grows each year and takes on more urgency as nonwhite students make up half of all students, yet it has been a long time since it was approached with vision to further integration and to provide the needed resources to do so. Instead, we have spent decades trying another approach: policies that have focused on attempting to equalize schools and opportunity though accountability and high-stakes testing policies, not to mention the federal subsidization of entirely new systems of school choice, like charter schools, without any civil rights provisions. These policies have not succeeded in reducing racial segregation or inequality. The resistance to change is well illustrated in local, state, and federal battles to fund schools in less affluent communities sufficiently to provide the same level of education as can be offered in more affluent areas. The intertwining of race and economic status now pits white, affluent communities against poorer communities of color in a competition for a limited amount of educational funding. And that argument is bitter.